EIGHTY-NINE: You’ve been compared to Janet Jackson, Sade, Aaliyah—even Britney Spears. Who do you look to from the past for inspiration? TINASHE: I think everyone that you mentioned has been an influence on me to a certain extent. Janet Jackson and Britney Spears, those were like the top two that I always looked to for inspiration. Janet, I always loved her music videos, her style and her live performance. And Britney, I always loved the way that she incorporated dance into all of her live performances, her music videos, everything that she did. I always really looked up to that and I really wanted to be doing that. I started training and dancing when I was like 4 years old, so for me artists who dance were definitely a huge inspiration. EIGHTY-NINE: Do you think about dance as you’re making music? TINASHE: I think at the end of the day it all starts with the music and the music is really what creates the emotion, but I think that dance is a tool and an outlet to be able to express myself physically and visually. I think it enhances. It’s more a tool and something that I just really love to do. EIGHTY-NINE: Who are artists today that you are into? TINASHE: I love The Internet. I think their new album is really awesome. I love James Blake. I love all of his stuff. I really love Sade—I think she’s probably one of my biggest influences. I kind of discovered her late but I have an obsession. EIGHTY-NINE: You’ve self-produced a lot of your music—what’s your creative process like? TINASHE: The creative process is interesting because I think it’s different every time. It kind of depends on who you’re working with, the environment that you’re working in and the producer if you’re collaborating or if I’m just doing it by myself. I do love creating music on my own. One of my favorite places to be creative is in my own environment, like my home studio. I have a recording studio that I built in my bedroom and I like to listen to music in my car—vibe out and just come up with melodies. EIGHTY-NINE: When you work with big producers, how do you make your voice heard? Does it get intimidating? TINASHE: It’s kind of a process. With everyone it’s different, but I think for the most part the longer that I’ve worked in this industry the more respect I’ve gained, and it just makes it easier when I go into those situations. EIGHTY-NINE: Anyone in particular you would love to work with? TINASHE: I’d love to collaborate with Janet Jackson and with Britney Spears. I’d love to work with Sade—that would be so amazing. I really enjoy the collaborative process in general, so I’d really like to be able to have all sorts of different collaborations in different genres, like Emily Haines, and I’d love to work with Little Dragon. EIGHTY-NINE: Pop stars can get a bad rep for being very manufactured. Is it important to you that people understand that you are the major force behind your music? TINASHE: Absolutely. I think it’s really important that things are authentic. I think people can see through it when it’s not, especially in this day and age where everything is so transparent. There has to be a level of sincerity. EIGHTY-NINE: You shopped around before deciding on signing with RCA. What were some of the points that were important to you before you signed your deal? TINASHE: It was really important for me to find people that at the end of the day respected my vision and what I’m about. It shouldn’t be so complicated; that was important to me. EIGHTY-NINE: How are you defining success? 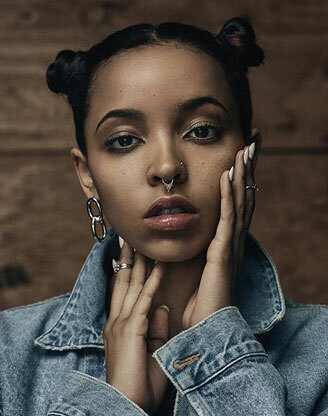 TINASHE: I just really want to make a mark, do something worthwhile. I think that’s probably my definition at this point. EIGHTY-NINE: How do you hope to influence your fans? TINASHE: I really want to just inspire people in general, especially young women, to be able to go after their goals and really have a vision, have a goal and accomplish it. I think that’s really important—helping people to realize that the sky’s the limit. You can really do whatever you want to do. EIGHTY-NINE: Your parents made some major sacrifices to help support your career. How much do you attribute your success to them, and what kind of values did they instill that have helped to shape you? TINASHE: I think my parents for the most part always just supported me and really instilled a great sense of self-confidence at a young age. I attribute a lot to them. EIGHTY-NINE: You have two younger brothers—do you think it’s hard for them sometimes to have a famous sibling? TINASHE: They’re young, 17 and 19, and still figuring out what they want to do. They’re right now just focusing on school, but I always try and encourage them just to set goals and to be able to go after them 150 percent. But I’m really lucky that they totally support me. We’re really close. EIGHTY-NINE: Your father is from Zimbabwe—have you ever visited? Has it at all inspired your creativity? TINASHE: I’ve never been there but really want to visit very soon. My dad left when he was really young; he was only like 6 or 7 years old. But I definitely feel a sense of pride in that culture, and I love the fact that like I have a name from it. Their music is amazing. I think it’s such a musical culture, it’s definitely part of why I grew up in such a musical household. We were just always surrounded by music. EIGHTY-NINE: What’s been the highlight on tour this time around? TINASHE: I think every time you go on tour, the best part is just being able to connect with the fans in like every city you go to. You know, there’s different people that you’re able to speak to. You see how much your music means to them. I think that’s really what makes it all worth it; it’s the most fulfilling part. EIGHTY-NINE: What do you think is the hardest part about being on tour? What do you miss most while being away from home? TINASHE: I think the hardest part is just not having any real stability; you’re always living out of a suitcase and repacking your stuff, in a new hotel and a new venue. There’s nothing that’s ever constant, which can be awesome but at the same time exhausting. There’s good and bad to everything. It’s great to travel and see the world. But at the same time you don’t live a set schedule so it’s hard to just like find time to do anything for yourself. EIGHTY-NINE: Outside of music, are there things that you aspire to be doing? TINASHE: Yeah, definitely. I really want to start directing videos; I’ve actually directed almost all my music videos. I want to be involved with everything. But right now I’m focused on just getting my album finished. That’s my number one goal.